As part of the Philippine Department of Tourism London’s program to tap the Overseas Filipinos in the UK as tourism promotions front liners to help entice their British friends, employers, colleagues, families and relatives to visit the Philippines, and to commemorate the 70th anniversary of Bilateral Relations between the UK and the Philippines, the Philippine Department of Tourism together with the Embassy of the Philippines-London ran a competition for a holiday for two the Philippines. 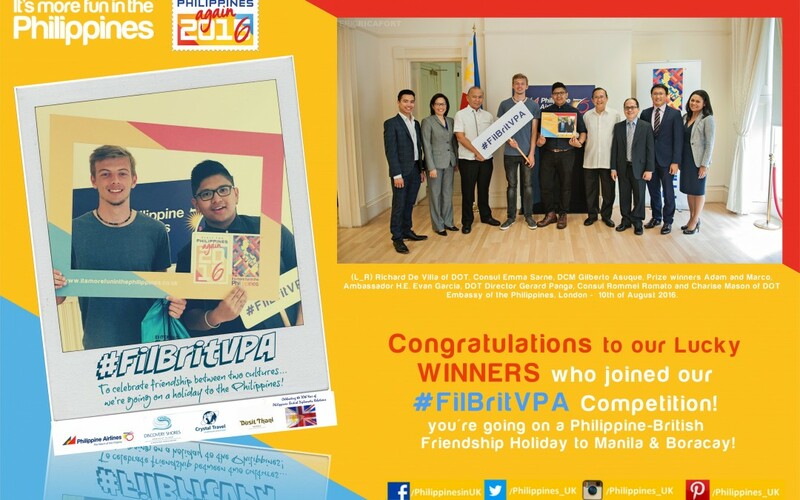 The competition invited all Filipinos in the UK to show pride and celebrate friendship with their British mate, targeting the Filipino-British community to commemorate the 70th year of the Philippine-British Diplomatic Relationship. Participants had a chance to win a 7-day luxury holiday for two to the Philippines – including London-Manila-London tickets via Philippine Airlines with hotel accommodations at Dusit Hotel Makati, return tickets from Manila to Caticlan via Crystal Travel, and 5-nights stay in Discovery Shores Hotel Boracay. 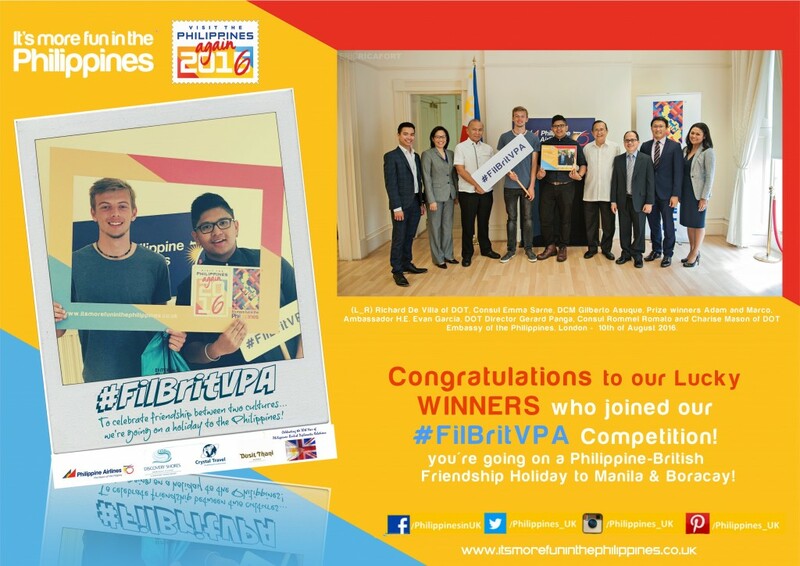 Participants were able to enter the competition using the official #FilBritVPA hashtag and entry form found on the Department of Tourism website and social media platforms . The winner of the competition was announced through social media on the 3rd of August and contacted through their provided email address. 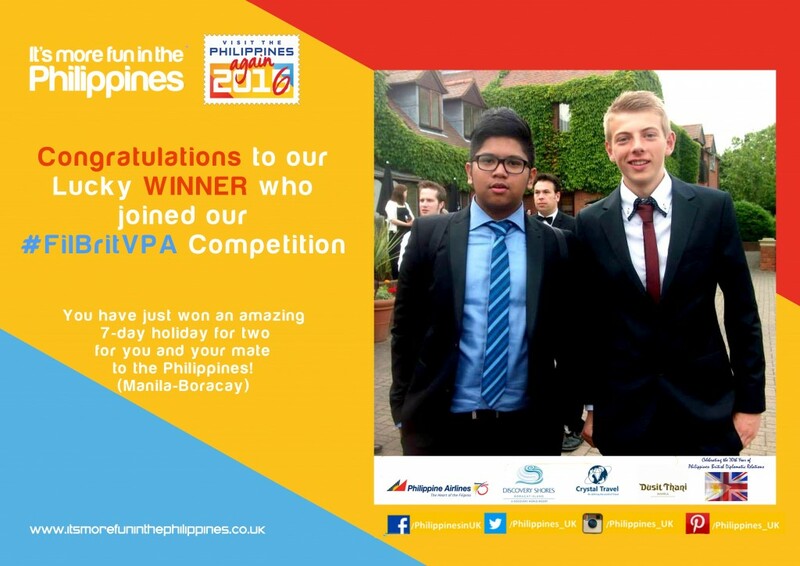 Marco and Adam, the selected winners from Warwick were both invited to come to the Embassy of the Philippines in London to receive their prizes and to meet and greet the Ambassador H.E. Evan Garcia together with the officers of the Embassy of the Philippines and the Department of Tourism team led by Tourism Attache Gerard Panga. They have confirmed their travel to the Philippines within the next few weeks and will be documenting their whole adventure together. 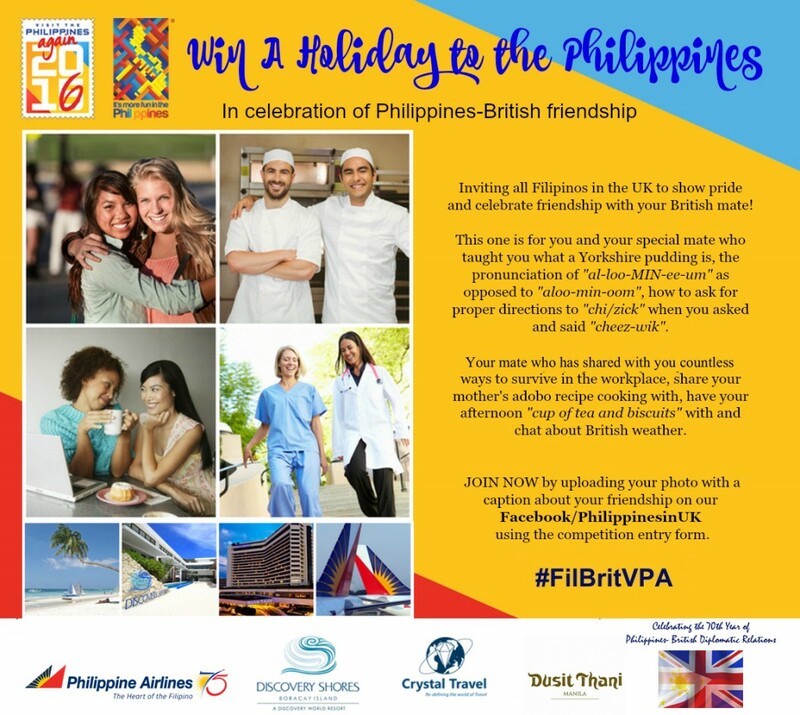 Follow their Philippine-British Friendship Holiday on #FilBritVPA and our social media platforms to join in their fun adventure from London to Manila and Boracay!.